Tim is a Trustee, Patron and Board Member of a number of statutory and voluntary bodies both locally and nationally. He has received a variety of national awards including The Royal Society of Arts Albert Medal (2003). In 2002 he was awarded an Honorary CBE in the New Years Honours List and In January 2011 he was appointed an honorary Knight Commander of the Most Excellent Order of the British Empire (KBE) by Her Majesty the Queen in recognition of his services to public engagement with science. This appointment was made substantive in June 2012 when he became a British Citizen. He has received Honorary Doctorates and Fellowships from a number of Universities. 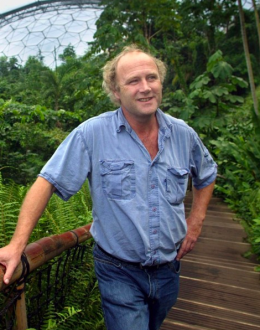 Tim was voted ‘Great Briton of 2007’ in the Environment category of the Morgan Stanley Great Britons Awards. In 2011 Tim was given a special award at the Ernst & Young Entrepreneur of the Year Awards, which recognises the contribution of people who inspire others with their vision, leadership and achievement. Tim has taken part in a quantity of television and radio programmes and has been the subject of ‘This is Your Life’ and a guest on ‘Desert Island Discs’. He is a regular speaker at conferences, dinners, Awards Ceremonies and other events. Tim is the author of books about both Heligan and Eden and he has contributed to publications on a wide variety of subjects. He lives in Lostwithiel, Cornwall and in his free time he enjoys reading, film, music and art.